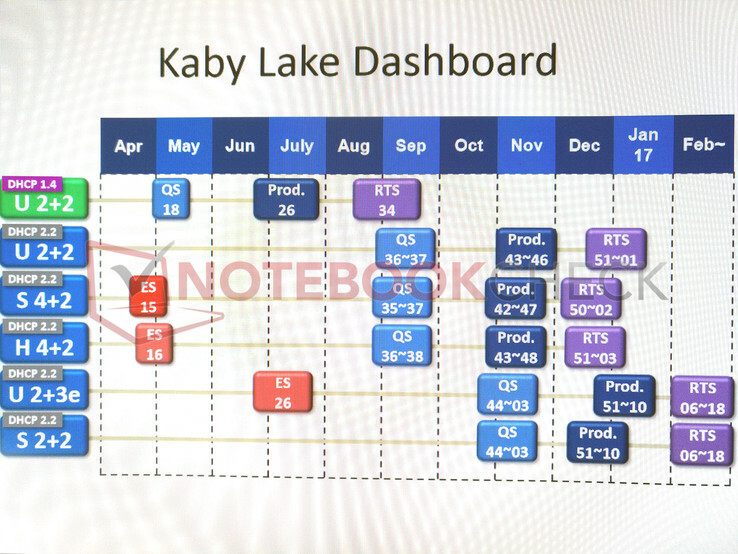 The expected launch of Intel Kaby Lake dual-core processors seems to be confirmed again. First-gen chips (with DHCP 1.4) should be released in September, chips with the new stepping (and DHCP 2.2 support) in the end of December or the start of January in combination with the quad-core processor from the S- (desktop) and H-series (mobile). 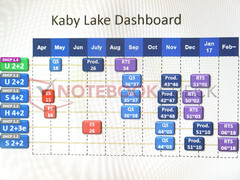 Speaking of facts based on non-confirmed rumors and leaks (we reported) is not permitted, but it still seems we will see the first processors from Intel's new Kaby Lake generation in notebooks soon. First benchmarks from an Intel Core i7-7500U already leaked as well. Based on the information that leaked now, this is the first version of the U-series dual-core processors with integrated Intel HD Graphics GPU, which supports DHCP 1.4. Based on the supposed Intel road map, the reworked U-series chips with the new stepping and support for DHCP 2.2 (for HDMI 2.0) will only be available in notebooks in the end of December, and their production is supposed to be launched in November. Also planned for December are the Kaby Lake models of the desktop quad-cores (S 4+2) as well as the mobile quad-cores (H 4+2), which will also support DHCP 2.2. The road map shows we will have to wait a bit longer for mobile dual-core CPUs with the more powerful Intel Iris Graphics (U 2+3e), which are planned for next February. The dual-core desktop processors (S 2+2) based on Kaby Lake should be available at this point as well. Those chips are also listed with DHCP 2.2 in the road map. A quad-core with Iris Pro (4+3e) or Iris (4+3) is unfortunately not listed in the road map.